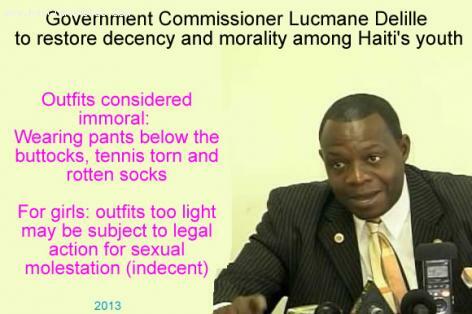 Me Lucmane Delille would like a return to the good old days, a time when youth were respectful to others and conscious of how the way they dressed and their general deportment reflected on the country, and he is not afraid to dictate the terms of this repatriation to morality in Haiti. The Government Commissioner recently let it be known he intended to fight the current trend towards youthful immorality as chronicled in the dress, behavior and patterns of young people. High on his list are tight clothing on young women, ratty shoes and socks and the prison-house style of wearing the pants below the buttocks. With apprehension threatened for behavior viewed as indecent, and with the list of possible offences extending to copious noise issuing from churches, night clubs, homes, and public transit vehicles etc. Commissioner Delille has set himself up for a fight by human rights groups across the country and the Diaspora. One such opponent of this stance is the Executive Secretary of the POHDH (Haitian Platform of Human Rights Organizations), Antonal Mortimer. He objects to the potentially discriminatory laws which will allow for stratified prejudice and the consequent violation of the human rights of the possible victims. He argues that morals cannot be policed and taught through repression, but by the instilling of good values. He would have the Commissioner seek to change the mindset of youths through positive advertisements in the media as, prosecuting people for having long hair or worn shoes would be tantamount to a violation, as these things themselves do not violate the law. WHAT ENTITY WILL FIX THOSE CODES AND LEGALIZE THEM? WE, IN HAITI, HAVE OTHER THINGS TO DO IN THIS FIELD.